Let us learn this interesting topic ‘Let Export Order’ and how does it work in an export trade. 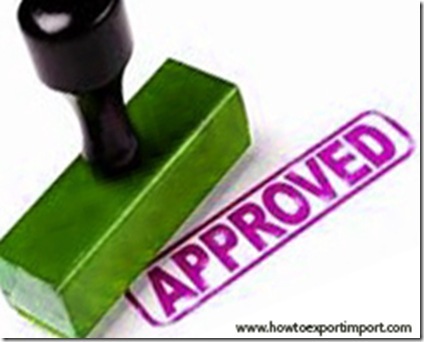 What is LET EXPORT ORDER in Export in India? How to obtain ‘Let Export Order’. Let Export Order is the final export legal procedure to move goods out of India under Export shipment. This procedure is to be completed with Indian Customs Department by assessing the value of goods and inspection of goods to be exported. Let us discuss ‘Let Export Order’ in simple language. As you are aware, any cargo crossing out of boarder of a country has to be regulated or monitored by government of each country. The government authority involved to handle export import trade in a country is Customs department of such country. The cargo to be exported can be moved out of country, only after completion of necessary legal export customs formalities of exporting country. Let us find, what happens in customs while filing shipping documents. You may appoint a customs house agent to handle your export shipments smoothly. As per government, it is not necessary to appoint a customs house agent (CHA), exporter can directly complete the customs procedures and formalities . However, in order to save time and concentrate in export business, most of the exporters appoint clearing and forwarding agents (customs house agents). Once you (exporter) have prepared commercial invoice and packing list, you deliver the same with a declaration called SDF to your appointed Customs House Agent. Now days, the filing of shipping documents can be done through on line 24 hours a day. Normally, CHA will have the said software downloaded in their office or residence to save maximum time for exporters and serve better. Once after receiving the invoice, packing list and SDF declaration, Customs House Agent files shipping bill online. The generation of shipping bill is a centralized process which is automatically generated serial wise at one place in the country, as all customs offices are linked with this location. Once after filing shipping bill with customs, cargo is moved to the airport, sea port, or CFS where in customs facility available to complete export procedures. The slot to unload cargo has to be discussed with carriers, because different carriers may have their own different handling locations under customs bonded area. The cargo is unloaded at the allotted slot, the CHA or you (exporter) approaches customs inspector to register goods online for inspection of cargo. The inspector physically inspect the cargo and makes sure that you (exporter) are exporting the cargo as per shipping documents and verifies quantity, marks and numbers and other required parameters. After physical inspection of cargo, examiner/ inspector of customs prepares inspection report online and await to get approval from appraising officer of goods or higher officials of customs by online. The value of goods is assessed by appraiser. Means, the value you (exporter) have mentioned in your invoice should not be abnormal with market price. Means, either should not be too law or too high. Why should exporter declare market value of goods in documents for Exports and Imports? Some of the importing countries levy tax/duty against the products importing to their country. If your product falls under that category, and you have under invoiced to save duty/tax for your overseas buyer, you will be penalized. As you are aware, exporter avails various export benefits on value basis. If any export benefit is provided on the basis of value of goods, a possibility of manipulation on documents by over invoicing are there. Here, exporter declares value higher than their actual sales and avails government export benefits. Am I right? Ok, let us come back to procedures on ‘Let export order’. Once after assessment and inspection completed, the report will be updated with the computer system and customs allows the said goods to move out of country by mentioning as ‘Let Export’. This is widely called as “Let export order”. Then, the prints out of shipping bill is generated under the said shipment and signs physically by the authorized customs officials. How do you value this article about Let Export Order – the legal procedures in Indian Customs for export? Have you satisfied with this article about Let Export Order? Difference between let export date and shipment date. Write below your thought and experience about Let Export Order. Perumal S: On 16 February 2015 I am passionate to do export business, so I formed JV Exports, obtained IE code etc. I registered my company in leading websites, but could not strike a deal. While surfing i came across your website http://howtoexportimport.com/, which has a lot of useful informations, For Beginners page is my favourite, it has almost all answers for my queries.My request to you sir is help me to get a good order, like suggest me with websites, govt organizations etc. Siddharth Gupta : On 13 August 2016 I got to know about you via a website howtoexportimport.com. I would like to know how to reach to genuine export agents as I have tried to reach them in the past but failed to get a genuine one. Also if you can tell me about some export promotion agencies and how can I get information about international market from government embassies. VINOD KUMAR YADAV : On 19 June 2018 Sir, I am interested to take CHA as a career in customs department. Please tell me details of career prospects and average income of CHA in India. Alok Mishra: On 31 December 2018 Good Morning, we have goods for exports and the same was "Let export". Customer in the mean time cancelled the contract and we had to return the goods back to the factory from the Dry port. Please advise procedure for the same. Do we have to file Bill of Entry? Difference between export bill collection and export bill discounting. Is IGST paid on imports by EOU is refundable?